Who is passenger X? Did he fall or was he pushed? Does it have anything to do with the rash of jewelry thefts or the murdered man found near the spot where Passenger X went overboard? With a killer on the loose, Georgie and Jack are soon enlisted to help solve the case. It’s a non-stop scramble to unravel the mystery before Georgie’s eccentric boss, “Mad” Max Marley, arrives in Tahiti demanding answers. That won’t be easy since Passenger X isn’t the only one with a dubious identity as the list of suspects grows. That list includes Georgie’s old friend Chef Gerard and his striking blond, blue-eyed Sous Chef, Paolo. Masters of five-star cuisine and wizards with chocolate, are they cooking up more than sumptuous feasts and banquets of desserts? How about the guy in the Perroquet suit or “Monster Marston,” a standout in the fitness center? It’s all hands on deck to figure out whodunit. Even Georgie’s cats get involved in the action on board this cruise that comes with a boatload of mystery! 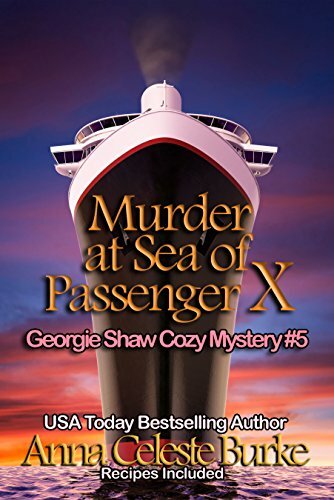 Newlyweds Georgie Shaw and Detective Jack Wheeler have set sail on the high seas thanks to Georgie’s boss, “Mad” Max Marley. Time to relax and enjoy themselves until they hear someone scream “Man Overboard”. When they arrive on the deck they are told someone was now lost under the water but also find a dead body and learn of some jewelry that has been stolen from some passengers. Within minutes Jack is asked to assist the ship’s security and of course Jack and Georgie are a package deal. Hopefully they can solve the case in time to enjoy a little bit of their honeymoon. The story is very clever as the suspects are limited to those aboard who had access to certain parts of the ship. There is a twist that takes the suspect list to another level too so while there are about a 1000 passengers certain information is obtained to cut that number down drastically. I enjoyed how Georgie and Jack work together. Smart, insightful, trusting each other thoughts and theories. They also have their funny sides too. They are two people who are very comfortable together and like me share a love for old movies. This is the first book I read in this series. I have wanted to read this author for a long time and I needed a book with an “X” in the title for my Alphabet Soup Reading Challenge so I hopped on this ship headed for Tahiti. I had no trouble at all jumping in at book #5 but now want to go back and get to know Georgie and Jack from the beginning. I also want to learn more about “Mad” Max Marley and his Marvelous Marley World. This was an absolutely perfect escape! Find out all about Anna Celeste Burke on her webpage here. You can also sign up for her mailing list and receive a free book. Find more books by this author here. I am giving away an e-copy of this book. I really enjoy this author’s writing and have several of both of her series. Thanks for the giveaway! SOUNDS LIKE A GREAT READ! THANKS FOR THE CHANCE! I have read other books in the series and really enjoyed them. Your review really made me want to take that virtual cruise too. I always like cozies where chocolate is included in the book. I’m also in the mood to board a cruise ship. A cruise ship is a great setting for a murder.